What do we know about the effects of performance information? Below is a tour of my recent findings on how performance information affects citizens, policy makers, and managers. Each element covers a specific effect backed by evidence in one or more studies. All results draw on social and cognitive psychology with a methodological focus on (quasi-)experimental designs. Some of these findings are also collected in the paper: Olsen, Asmus Leth (2015). The Numerical Psychology of Performance Information – Implications for Citizens, Managers, and Policy Makers. Public Performance & Management Review, 39(1), 100–115. Equivalence Framing Effect: Positive-valence performance information will lead to more positive evaluations and negative-valence performance information to more negative evaluations—even if the underlying numerical information is logically equivalent. 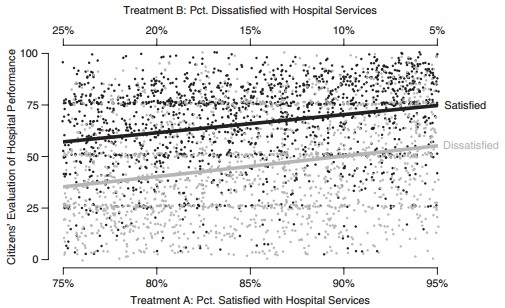 Example: Presenting citizens with 90% satisfaction rate vs. a 10% dissatisfaction rate changes their evaluation of a public service with around 20 points (on a 101-point scale). Leftmost Digit Bias: Small changes in numerical performance information, which happen to shift the leftmost digit, will have a greater impact than objectively larger changes in performance information which leaves the leftmost digit constant. Source: Olsen, Asmus Leth (2013). Leftmost-digit-bias in an enumerated public sector? An experiment on citizens’ judgment of performance information. Judgment and Decision Making 8 (3), 365–371. Negativity Bias: Negative performance information will have a greater impact than positive performance information of the same magnitude. Example: Citizens rate a school where 15% of the students fail as much worse than a school where 85% pass their exams, while the latter receives about the same evaluation as for the school were citizens are told about both the failure and pass rate at the same time. Source: Olsen, Asmus Leth (2015). Negative Performance Elicits Responsibility Attributions. Paper to presented at the American Political Science Association Meeting, San Francisco, CA, September 3–6, 2015. (R&R in JPART). Example: Citizens were 30% more likely to spontaneously provide causal attributions about performance after being exposed to negative valence school performance information than for comparable positive valence information. Examples of attributions included are; >>replace the management<<, >>the commitment among the personnel might be too small<<, or >>poorly managed school<<. Eliciting An Emotional Response: Episodic information (e.g. individual case experience) about a public service elicit a stronger emotional response than more pallid statistical performance information. Example: Citizens assigned to simple case description of "a patient", "Birgitte", or "Eriks" experience with a hospital maltreatment elicited much stronger emotional responses than exposure to a comparable information about "1%" (of 100 patient) maltreatment rate. Even a "10%" maltreatment rate elicited less compassion among citizens than the episodic maltreatment descriptions. Source: Olsen, Asmus Leth (2017). Human Interest or Hard Numbers? Experiments on Citizens' Selection, Exposure, and Recall of Performance Information. Public Administration Review, 77 (3): 408-420. More Elaborate Recall of Episodic Information: Recall of episodic information about public services is more elaborate and concrete than recall of statistical information about public services. Example: If asked to recall information about the performance of public services, citizens are more likely to recall episodic information than statistical information and the episodic information they recall is more elaborate and concrete. Relative Comparison and Social Reference Points: Comparisons with the performance of other units (social reference points) have a stronger effect on performance evaluation than comparison with past performance of the same unit (historical reference points). Example: Citizens responded twice as strongly to performance information about other schools than to past year's performance of the school they are evaluating. Source: Olsen, Asmus Leth (2017). Compared to What? How Social and Historical Reference Points Affect Citizens' Performance Evaluations. JOurnal of Pulic Administration Research and THeory. Example: Politician's are more likely to set taxes just below salient thresholds that would increase the perceived level of taxes. Accordingly, we find that 9-ending tax rates are over-represented relative to other tax-ending decimal digits. Source: Olsen, Asmus Leth (2013). The politics of digits: evidence of odd taxation. Public Choice, 154 (1-2), 59-73.